According to a recent UCL-led research, two-dimensional (2D) nanomaterials have been created by dissolving layered materials in liquids. The liquids can be used to apply the 2D nanomaterials across large areas and at minimal costs, paving the way for a number of important future applications. 2D nanomaterials, such as graphene, show promise to transform technology through their extraordinary physical properties, but their translation into practical applications has been restricted due to the challenges involved in the manufacture and manipulation of 2D nanomaterials on an industrial scale. The new process, published in the Nature Chemistry journal, can create single layers of several 2D nanomaterials in a scalable way. The research team used the technique on a broad range of materials, including those with thermoelectric and semiconductor properties, and produced 2D materials that could be used, for instance, in solar cells or for converting wasted heat energy into electrical energy. 2D nanomaterials have outstanding properties and a unique size, which suggests they could be used in everything from computer displays to batteries to smart textiles. Many methods for making and applying 2D nanomaterials are difficult to scale or can damage the material, but we’ve successfully addressed some of these issues. Hopefully our new process will help us realise the potential of 2D nanomaterials in the future. The researchers then gently dissolved the resultant layered material salts in selected solvents without stirring or using chemical reactions. The resultant solutions of 2D nanomaterial sheets have the same shape as the starting material but have a negative charge. The researchers studied the contents of the solutions using transmission electron microscopy and atomic force microscopy to examine the thickness and structure of the 2D nanomaterials. They discovered that the layered materials dissolved into small sheets of undamaged, clean, single layers, isolated in solutions. The team from UCL, University of Bristol, Cambridge Graphene Centre and École Polytechnique Fédérale de Lausanne, were able to show that even the 2D nanomaterial sheets, consisting of millions of atoms, made stable solutions instead of suspensions. 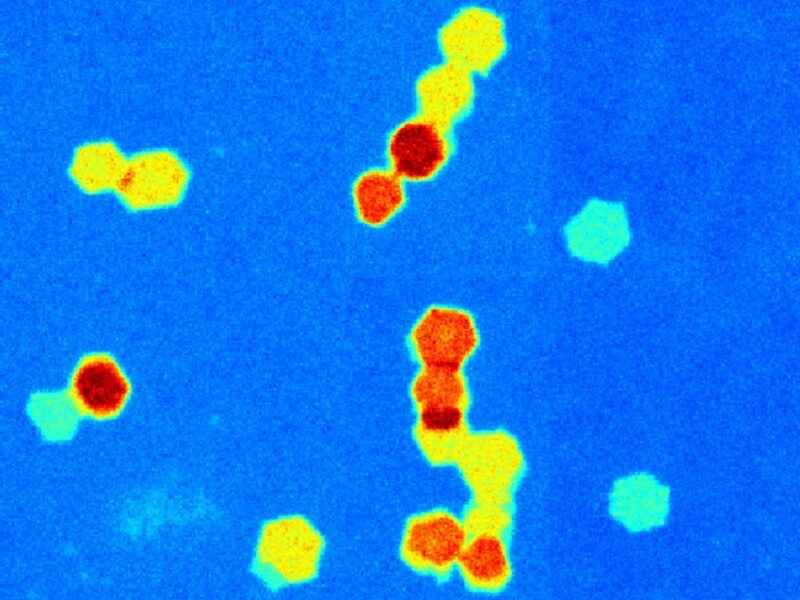 We didn’t expect such a range of 2D nanomaterials to form a solution when we simply added the solvent to the salt – the layered material salts are large but dissolve into liquid similar to table salt in water. The fact that they form a liquid along with their negative charge, makes them easy to manipulate and use on a large scale, which is scientifically intriguing but also relevant to many industries. We’ve shown they can be painted onto surfaces and, when left to dry, can arrange themselves into different tiled shapes, which hasn’t been seen before. They can also be electroplated onto surfaces in much the same way gold is used to plate metals. We’re looking forward to making different 2D nanomaterials using our process and trying them out in different applications as the possibilities are near endless. UCL Business PLC (UCLB), the technology commercialization company of UCL, has patented this research and will offer support for the commercialization process.